« AADL + NNA2 present: Sega Nite! How do tiny twisted trees come to be? What’s happening in the airwaves around you as amateur (aka ham) radio operators connect? What’s in store at a small version of Maker Faire in our very own backyard? 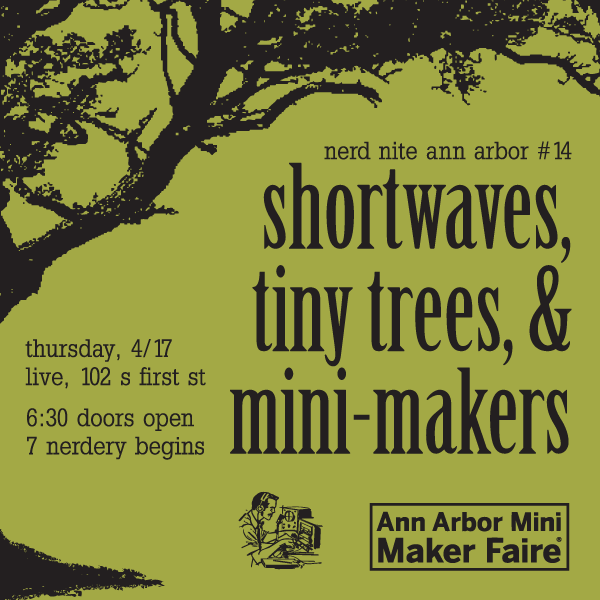 Come have a drink, meet up with your fellow nerds, and learn about little leaves, hams, and mini-makers! When: April 17th, 2014, doors at 630pm, talks at 7pm! Tickets: At the door or https://nna2-april-2014.eventbrite.com! Amateur, or ham, radio operators are arguably the original nerds. Ham radio has been around for more than 100 years, and is still going strong. In fact, there are more than 700,000 licensed radio amateurs in the U.S. today. Longtime ham radio operator, Dan Romanchik, KB6NU, will talk about the history of amateur radio, modern amateur radio technology, amateur radio activities in and around Ann Arbor, and how to get your amateur radio license. 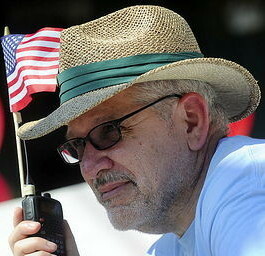 Dan Romanchik, KB6NU, has been a radio nerd for as long as he can remember. He got his start as a kid, listening to the shortwave band on his grandparents’ Philco console radio. He is a past president of ARROW, the local amateur radio club, and station manager for WA2HOM, the amateur radio station at the Hands-On Museum. In addition to talking to people all over the world via shortwave radio, he enjoys teaching amateur radio classes and has written three amateur radio license study guides. He also blogs about ham radio at www.kb6nu.com. This will be a brief introduction to the art and technique of bonsai. 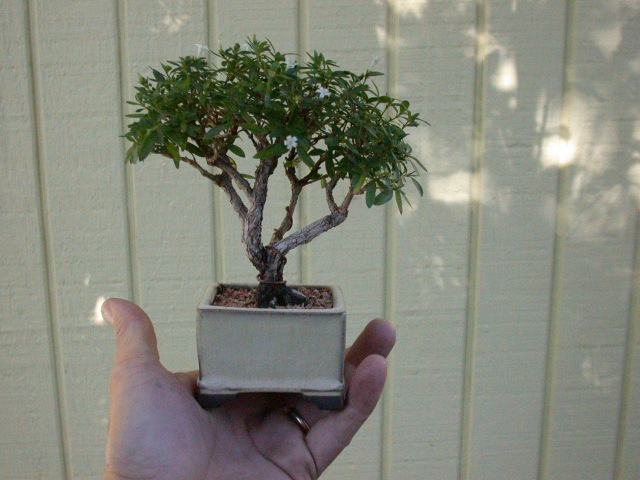 Topics will include a discussion of the origins of bonsai, and how the art has evolved. We will look at examples of some bonsai styles and discuss bonsai aesthetics. Basic bonsai techniques and horticulture will also be addressed. Jay Sinclair is a middle school Earth Science teacher. He has long been drawn to activities that have both technical and aesthetic aspects. Jay has been involved in bonsai since the early nineties, and after more than 20 years still considers himself a beginner. His other interests include astronomy, nature study, and cycling, on one or two wheels. All Maker Faires involve similar ingredients: a large space, lots of noise, interesting activities, and creatives all around. But each Faire highlights the unique attributes of the community members who participate in the Faire. 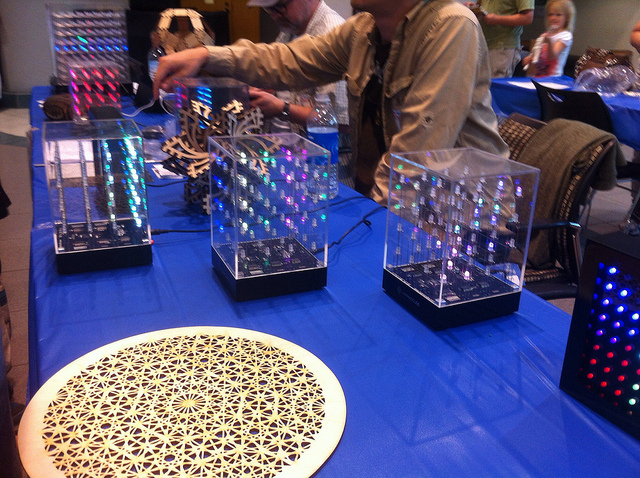 The Ann Arbor Mini Maker Faire showcases just what makes this town such a great place to live in: the many people, skills, talents, and interests that come together for one day to celebrate making and learning together. Emily is a projects librarian at the University of Michigan Library. She is also a director of A2Geeks, a local organization whose aim is to create a flourishing community that supports creative and technologically minded people in Ann Arbor She has helped organize the Ann Arbor Mini Maker Faire for the past two years. Copyright © 2009 Nerd Nite Ann Arbor. All Rights Reserved.